With fried taco shells, tons of cheese, and globs of sour cream, taco salads are usually anything but healthy! 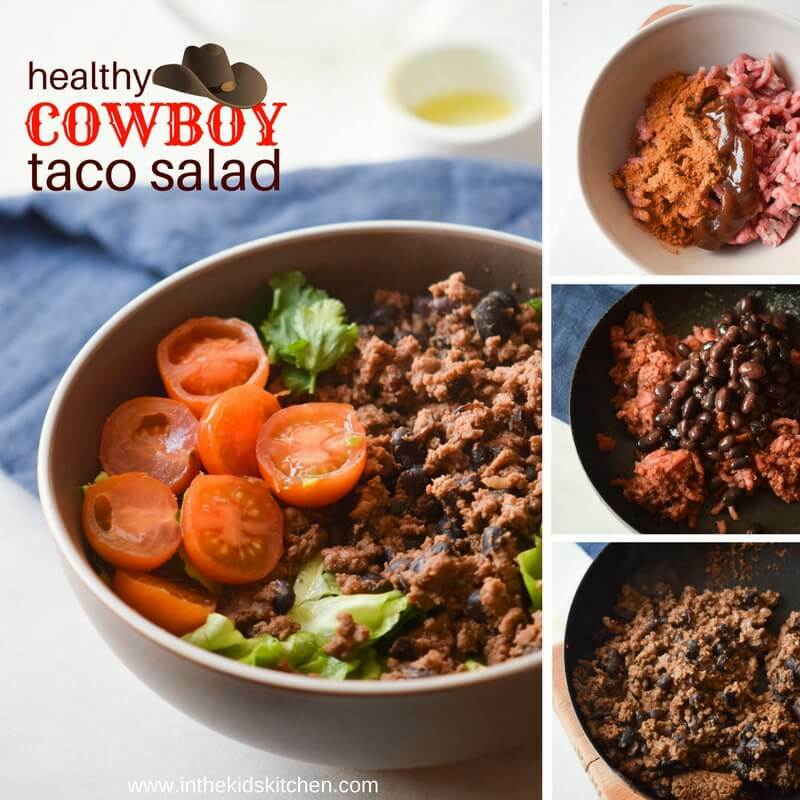 However our Healthy Taco Salad (or as my daughter likes to call it, Cowboy Salad) is not only hearty and satisfying, but it’s actually good for you too! 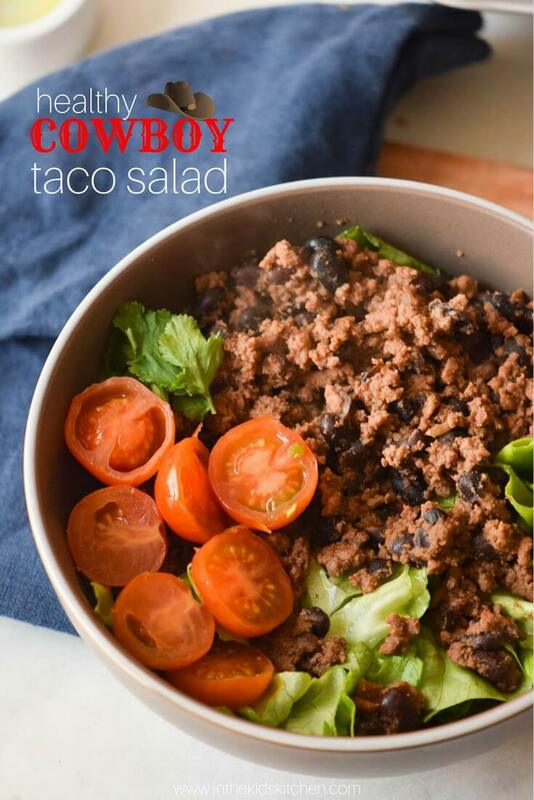 Our healthy taco salad isbit different than your typical version (in a good way!) — we use more veggies and include delicious barbecue sauce to jazz things up! Tip: Feel free to use a sugar-free barbecue sauce, Asian stir fry sauces – whatever you want to customize this salad bowl to your personal preferences. Make it Paleo! Simply omit the beans and BBQ sauce. Place a frying pan over medium heat and add the beef, taco spice and BBQ sauce. Cook until the beef is fully browned, about 5 minutes. Drain off any excess fat. Add the beans and cook until fully warmed through. Taste and adjust seasoning to preference. 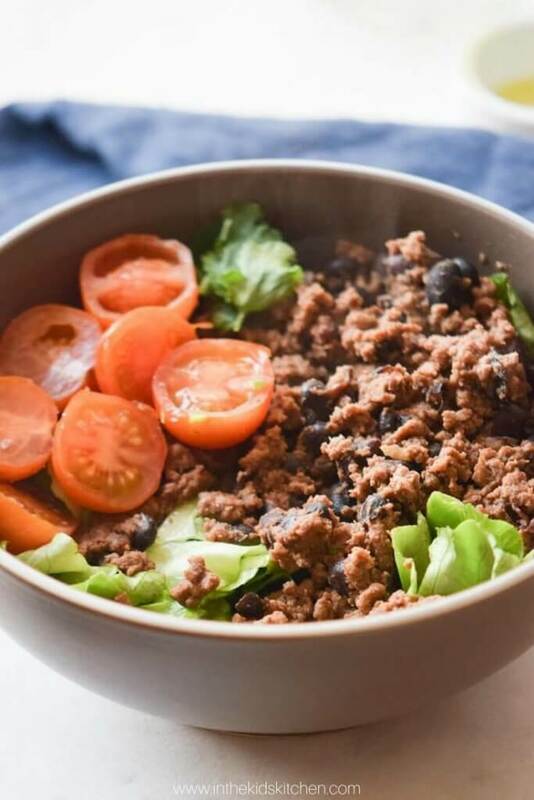 Fill your bowls with lettuce, then add 1/2 cup ground beef mixture, a sprinkle of cherry tomaotes and parsley. 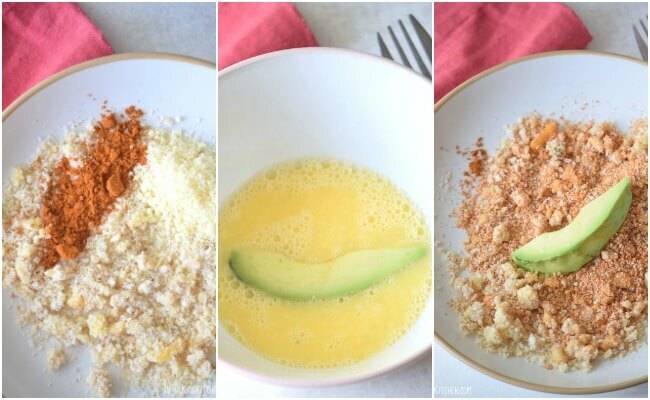 Customize your bowls! 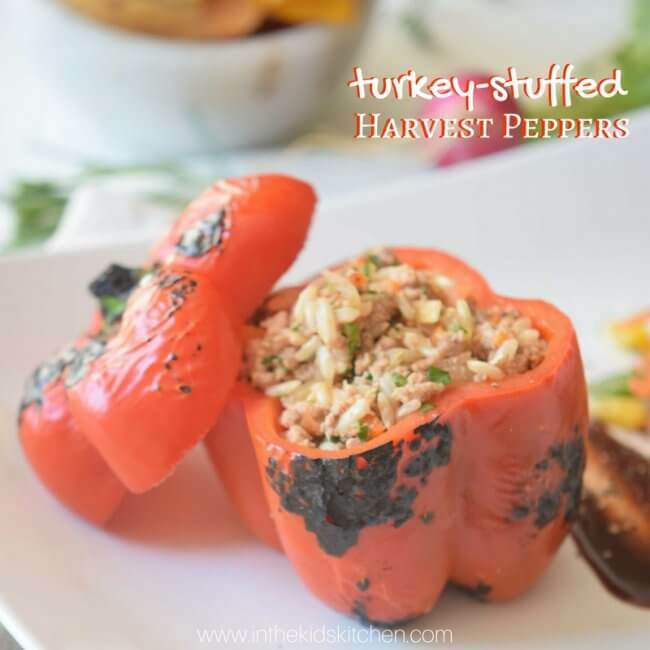 Serve with your favorite accompaniments like salsa, guacamole, and sour cream. Kids will have a blast making their bowl their own! 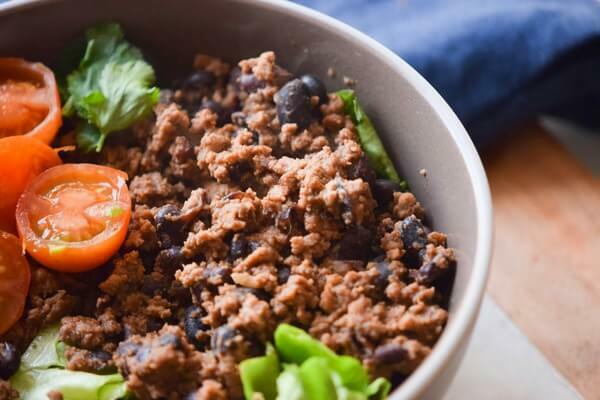 For another yummy protein bowl recipe, try our Sweet Potato & Turkey Chili too! Place a frying pan over medium heat and add the beef, taco spice and BBQ sauce. Cook until the beef is fully browned, about 5 minutes. Add the beans and cook until fully warmed through. Taste and adjust seasoning. Serve with salsa, guacomole and sour cream/cheese on the side for everyone to dress up their taco salad as they'd like. 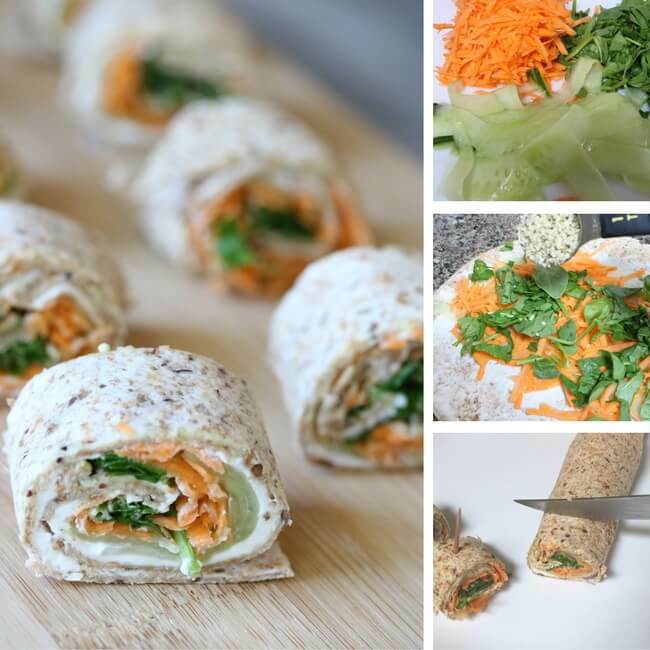 Do your kids eat salad? What do you add to get them excited about it?